Its make from mountain stone. 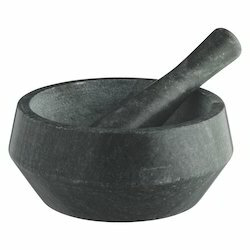 Granite Mortar And Pestles are way to go these days with the available choices for cooking and trying different cuisine recipes. 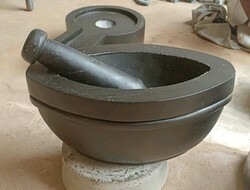 These mortor and pestle sets can be used to do multi various tasks from crushing peppers, grinding ginger, bruising garlic, to make thai green curry paste to anything under the sun. Perfect housewarming gift for the women who loves to cook. A unique design for your kitchen. We Deal on in Basalt Stone Artifacts. Traditional khalbatta in basalt stone. Completely hand crafted in local basalt stone.